Puerto Morelos Blog: What is a Notary in Mexico, anyway? Bet it's not what you think! What is a Notary in Mexico, anyway? Bet it's not what you think! A Notary in Mexico is COMPLETELY different from Notaries in the U.S. and Canada. Other than sharing names via literal translation, the similarities basically stop there. A Notary, "Notario" in Spanish, is a licensed attorney who has had an internship in notarial law, worked under a Notary for some time, has passed a public examination, and then has been given a lifetime appointment by the State to act as a Public Notary. They oversee many types of transactions in Mexico: Incorporation Documents, Wills, Rental Contracts, Powers of Attorney, Protocolize Public Deeds, Real Estate Sale Transaction Contracts, etc. Register the property's deed (escritura) with the Registrar of Deeds after the sale. It is important to note that the Notary is a neutral party -- therefore he is not representing the buyer or seller's particular interests. 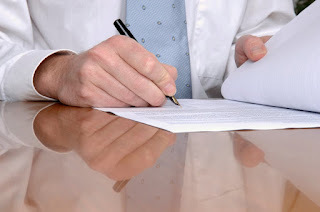 The Notary will ensure that everything meets legal standards. However, the onus is on the buyer to ensure that he has made wise choices up to the point of the sale and/or is aware of the implications of his/her actions. While not necessary, this is why many buyers choose to also higher an attorney to represent/advise them during the sale process. Q: Who is Mexico's Largest Gold Extractor? It's TIGRES Season! WhooHoo for Baseball! Agility Dog Show this Saturday and Sunday!